Reports have suggested that Moratti – a former president and revered figure at Inter – wanted coach Walter Mazzarri sacked in response to the club’s poor league form. Inter sit ninth in Serie A and have won just two of their seven league matches this season. An embarrassing 4-1 home loss to Cagliari last month was followed by a 3-0 defeat at Fiorentina. And although Inter rescued a point in a 2-2 draw with Napoli on Sunday, a lacklustre showing in the UEFA Europa League on Thursday proved they still have a long way to go. Inter, who top Group F in Europe’s second-tier competition, were held to a goalless stalemate at home to Saint-Etienne in which they were toothless in attack despite controlling possession. 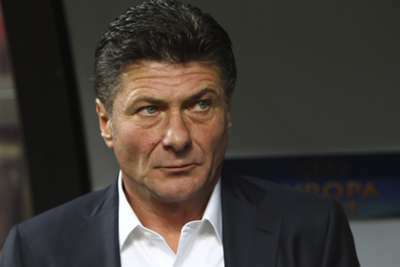 It prompted ex-Napoli coach Mazzarri to declare that Inter are in an “emergency situation” after the game, hardly words to fill the club’s supporters with confidence. Something that should boost Inter fans, though, is their record against Cesena. Inter have won their last six Serie A matches against this weekend’s opponents, most recently in April 2012 when Cesena, who finished bottom that season, lost 2-1 at San Siro. Mazzarri’s men have had few problems in attack in 2014-15, scoring 13 league goals. Just three sides – Milan, leaders Juventus and Roma – have netted more. Cesena enter the clash in poor form, without a win since a 1-0 success against Parma on the opening day of the Serie A season. A 1-1 home draw against Milan last month was promising but they will be disappointed with a 2-1 loss at Palermo last time out. Palermo, who were without a win this season, clinched all three points thanks to a 91st-minute goal from defender Giancarlo Gonzalez. Yann M’Vila suffered a sprained knee against Saint-Etienne and joins a lengthy Inter injury list that contains the likes of Gary Medel, Pablo Daniel Osvaldo and Yuto Nagatomo.